Woolworths’ partnership with Qantas Frequent Flyer directly competes with its rival Coles’ link-up with flybuys. In this guide, we give you information the partnership and our take on how to maximise your points earn. When placing an order with Woolworths Online, you can choose between earning Qantas Points through the Qantas Shopping online portal and getting cashback with Cashrewards. The regular earn rate through Qantas Shopping is 2 Qantas Points per $ spent, which I value at $4 per $100 spent. 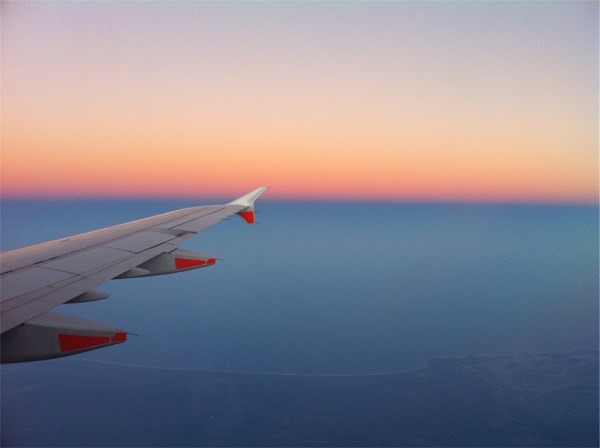 Given you would earn $5 cashback on a $100 order with Cashrewards, I would recommend opting for cashback with Cashrewards unless Qantas offers at least 3 Qantas Points per $ spent with Woolworths (which it occasionally does—check the current offer here). 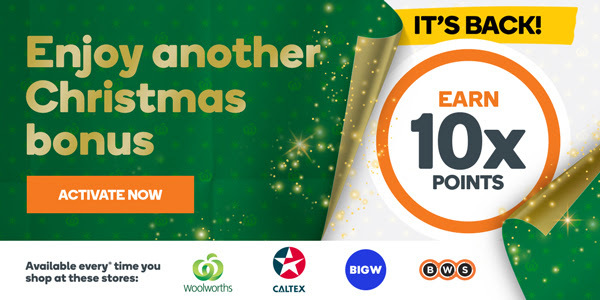 Give your festive season a boost with big bonus points every time you spend $50 or more! Available at Woolworths, BWS & BIG W in-store or online and at selected Caltex fuel outlets. There is no limit to the number of times you can take advantage of this promotion. Using our current valuation of Qantas Points at 2c a piece, a shop of $150 at Woolworths with this promotion will earn you $13 worth of points, which is almost 10% of your purchase—that’s great value! 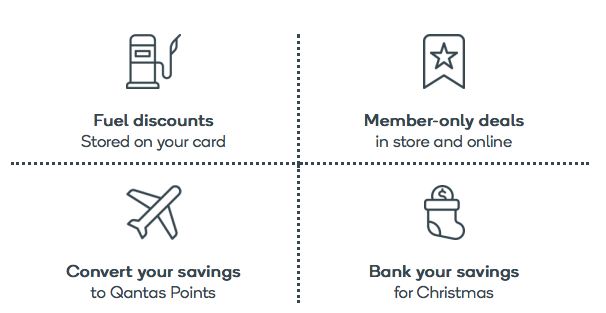 Note that Woolworths Rewards points are only converted into Qantas Points at the end of every quarter when your balance hits 2,000 Woolworths Rewards points. You need to activate the offer here and scan your Rewards card in-store or shop online at Woolworths, BWS, BIG W and selected Caltex fuel outlets. You need to leave at least two hours between activating the offer and shopping. 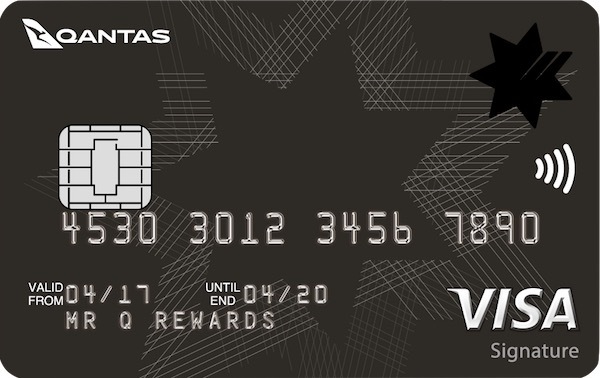 As an example, if you took advantage of all three offers on a $150 online spend, you’d get 1500 bonus Qantas Points + 450 American Express Membership Rewards points, worth ~$38—huge value! It is relatively simple but still needs a little explaining. It is nice to see that the supermarkets have really innovated and differentiated themselves from each other (sarcasm fully intended). Note that you will not earn any points on smoking products, gift cards, mobile recharge, Woolworths Mobile, travel cards and tickets, delivery charges, internet cafes, Carpet Care, Woolworths Flowers or lottery products. You can also earn bonus points from offers sent to your inbox. What does this mean in terms of points values? 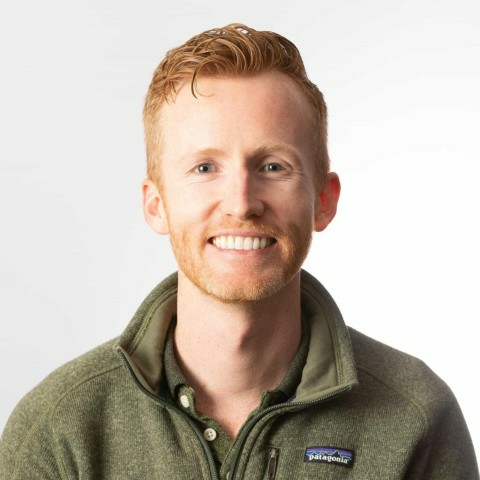 As we’ve discussed in depth before, valuing your points is really important for you to make an informed decision on how you earn and use them. Because you have a cash equivalent for your Woolworths points (a discount off your shopping), we can unequivocally say that each Qantas Point you earn is costing you 1.1c. Why? 2,000 Woolworths points = $10 in Woolworths credit or 870 Qantas Points. You are forgoing $10 in credit to pick up 870 Qantas Points, so each Qantas Point is being earned at 1.1c each. Is this a good deal? Well, it’s OK. I usually value my Qantas Points higher than 1.1c, but not by much more. If you are points-rich, then it’s probably worth taking the cash; if you want more Qantas Points, then it is not a bad rate at which to acquire them. 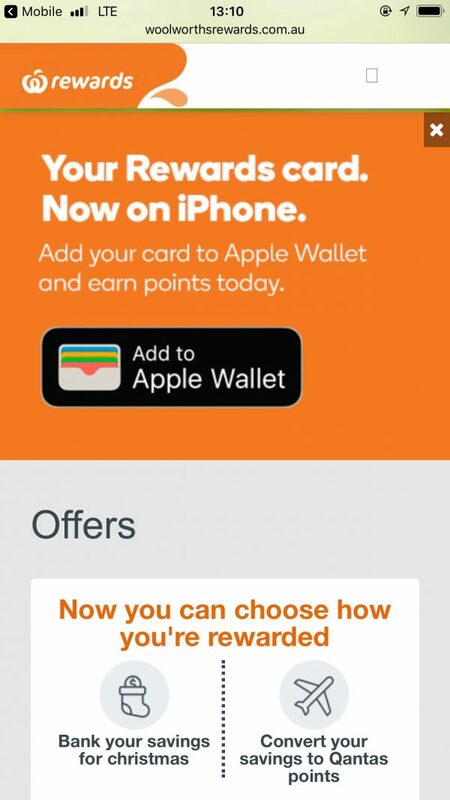 Instead of having to scan your plastic Woolworths Rewards card to earn Woolworths Rewards points (convertible to Qantas Points), you can add your card to Apple Wallet. Follow the prompts and then you’ll be able to earn points at the checkout by just double-clicking the Home button (you don’t have to unlock the phone), selecting your Woolworths Rewards card, tapping it on the credit card terminal and verifying your identity with your Touch ID or Passcode. What about previous versions of the program? 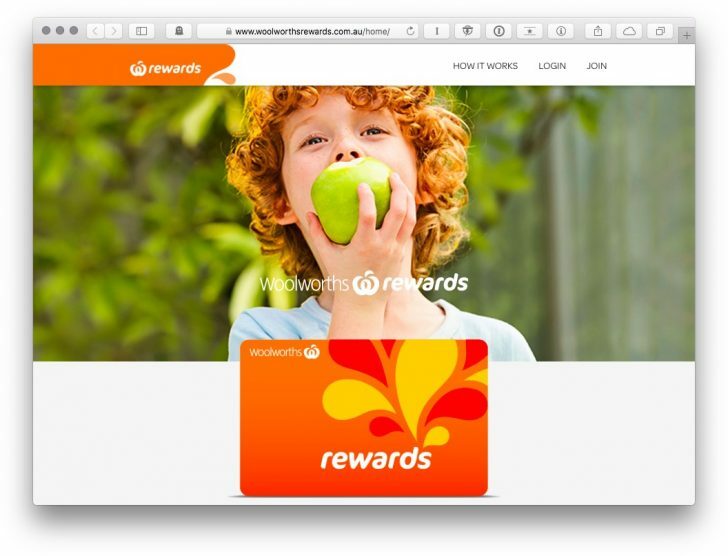 I have avoided a comparison to the old Everyday Rewards program so far, to avoid drawing any negative conclusions about Woolworths Rewards to this point. 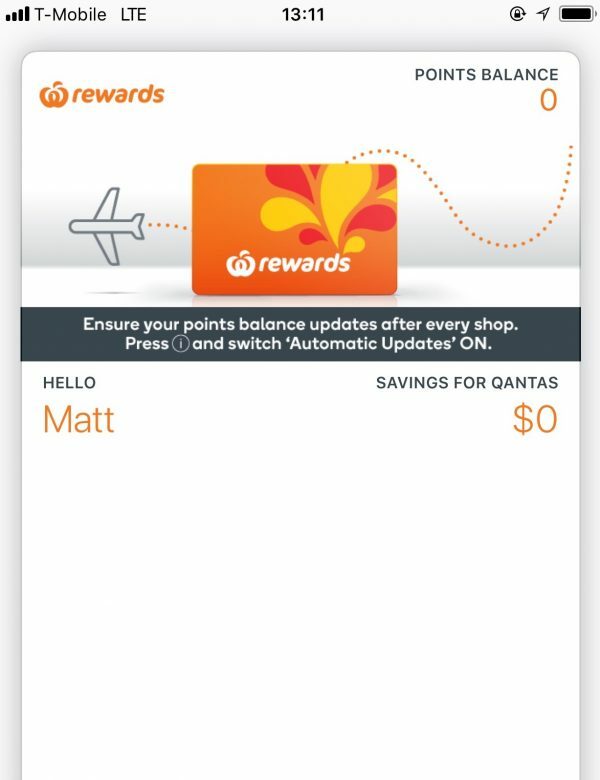 The old Everyday Rewards program had almost double the Qantas Points earn rates, but only on basket sizes over $30. But that just doesn’t matter—there is no chance of the old program coming back, so we won’t waste any more time thinking about it. Worth noting is that the new program at least allows you to earn points on smaller transactions, which is a bit of a behaviour change if you were used to trying to batch your grocery shopping to get over the $30 minimum threshold before—you don’t need to worry about that now. Previously, this program was not appealing enough to really make shopping at Woolworths to earn Qantas Points a complete no-brainer. Neither Coles or flybuys had a standout feature which meant you should absolutely choose one program and supermarket over the other. However, if you are doing your grocery shopping online, then the bonus Qantas Points available may sway your decision. 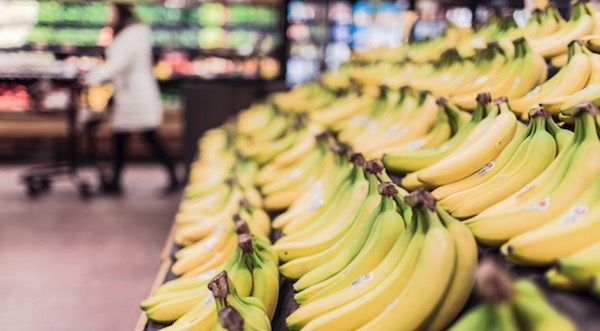 It is worth remembering points earn opportunities from using a credit card that offers bonus points for supermarket shopping will usually outweigh bonus points offerings from the supermarkets themselves. Interesting article. I use both Woolworths rewards and flybuys. The special email offers i receive from flybuys are massive earns compared to woolies. My husband however receives greater woolies offers then me. Hello Why cant you get woolworths points when you buy fuel at a WW Caltex and pay with a Caltex fuel card ? You get flybuys points at a shell when you pay there with a Shell fuel card . Good question to which, unfortunately, I am not privy to the answer! Do you still earn 2 points per $ spent if you pay with a woolworths egift card? My preferred method of shopping at wollies currently is to buy an woolies egift card at cashrewards site. You get 5% discount (e.g. a $100 gift card costs $95). Using my Qantas Amex ultimate card gets me 1.5c per $ for that transaction. Less points but more cash in my wallet is better surely? If I can get a further 2 points per dollar paying with my egift card via the qantas mall that would make the deal even sweeter? Do you mean American Express Platinum Edge for 3 points, i don’t think the Charge earn rate is 3 points. Your link now goes through correctly as previously pointed out by another reader to the ‘Platinum Edge’, but the hyperlink title in your story still reads as ‘Platinum Charge’; please amend, as this is misleading. Done! Thank you for following up. Clearly this has not been tested by the writer as the screen shot shows T-Mobile which is a USA based carrier. Looks like Woolies has joined the Qantas Points Online Mall giving you two points per $1. There’s a bunch of new retailers in their as well. The bonus point offers however are very good on various products which can quickly boost points. I average about 6000 qantas points a quarter so not too bad for what you would spend anyway. Somewhat related, worth noting that the Android Pay app lets you add loyalty cards (barcoded ones like Flybys, Woolies Rewards, Dan Murphys, etc) so I no longer carry physical loyalty cards with me to the supermarket. And between both programs, I know I’m not going to earn many qantas points through Woolies but I utilise the cash-back rewards in Flybuys (and shop at Coles group more often) which benefits me more especially with the much greater number of bonus point offers Coles have, Woolies rarely issue such offers. I use Stocard app on my iPhone for this and it’s great. Especially useful for all those memberships you need overseas for those one off purchases because you get a discount (e.g. Countdown NZ or Walgreens US). I do know however, that flybuys needs your physical card if you want to take advantage of $10 off your shop, so don’t lose the physical card. I use stocard and flybuys card to get the $10 off.. it works just fine..Physical card not needed for me. When will Tasmanians be able to earn Qantas frequent flyer points shopping at Woolworths? It seems Tassie is always left out, we are a State of Australia too. This seems like a no brainier to me, bank the Woolworth’s dollars that’s the equivalent to .5% off your shop rather than converting to Qantas points which equates to .435% off in monetary terms as you can purchase Qantas points for 1c per point from many sellers. Woolworths have really given no incentive not to take the cash. Qantas Cash have just added Woolworths and Caltext gift cards at 5 points per dollar spent. Saving about $5000 a year buys far more holiday miles than Woolworths are now trying to give back.